llustrious cover art. Sing-a-long hooks. Contagious melodies. Symphonic rock bluster. Signature Wurlitzer electric piano sounds. Two Grammy Awards. More than 20 million copies sold. Every aspect of Supertramp's 1979 album screams blockbuster, not the least of which is the production, the result of painstaking studio setups and months of mixing. The dynamics, color, and presence are all here in their full-range glory. Breakfast In America" was pretty much the peak of Supertramps career after the minor success of their 5 previous albums. Standout tracks include the big hits "The Logical Song", "Breakfast In America" and "Take The Long Way Home". For lovers of late 70's melodic pop-rock this is a definite buy. A true classic gem! 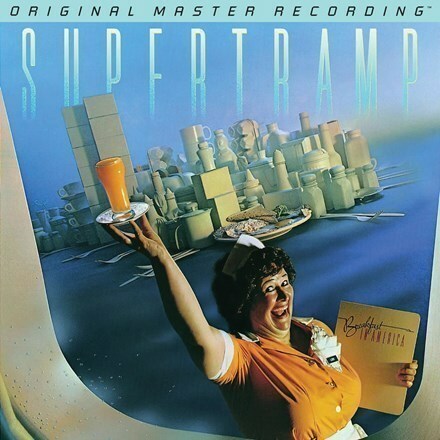 Supertramp's Blockbuster Features Catchy Hooks, Rhapsodic Melodies, Symphonic Bluster, Meticulous Production: Breakfast in America Includes "The Logical Song," "Take the Long Way Home"
Supertramp's Breakfast in America has it all: Illustrious artwork. Sing-a-long hooks. Contagious melodies. Symphonic bluster. Rhapsodic thrust. Signature Wurlitzer electric piano sounds. Two Grammy Awards, including one for Best Engineered Album. More than 20 million copies sold. Four Billboard hit singles that continue to dominate radio airplay today. Every aspect of the chart-topping art-rock set screams blockbuster, not the least of which is the production, the result of painstaking studio setups and months of mixing. Now, you can experience the sonic brilliance in unprecedented clarity on Mobile Fidelity's definitive-sounding reissue. Mastered from the original master tapes, this numbered-edition hybrid SACD wrings out the record's dynamics, colors, and tones in all their full-range glory. Absent artificial ceilings, Breakfast in America unfolds with an expansiveness and radiance that parallels the vibrancy of its iconic New York-themed cover. Crucial traits such as imaging, separation, balance, transients, and openness achieve near-epic levels of realism and presence. Songs unfold and breathe on mammoth soundstages that put the effort's legendary production – and stellar playing – into proper perspective. The 1979 set has been reissued multiple times in the past, but it's never sounded so engaging, lifelike, or entertaining. Breakfast in America also retains its vitality because of its expert instrumentation and placement. Deemed a "a textbook-perfect album of post-Beatles, keyboard-centered English art rock that strikes the shrewdest possible balance between quasi-symphonic classicism and rock & roll" by Rolling Stone shortly after its release, the record serves as a blueprint of reference-setting production and mixing. Check the scorching guitar outro on "Goodbye Stranger," gospel accents on "Lord Is It Mine," saxophone lines on "Take the Long Way Home," or chemistry of the choruses on basically every piece here. It's enough to make one long for the '70s again. It is worth noting that Mobile Fidelity Sound Lab stands out as one of few record labels that independently invests in research and development of audio technology. With proprietary innovations such as GAIN 2™, general music enthusiasts and audiophiles alike have reaped the benefit of a higher consumer audio standard without investing in costly new hardware. Mobile Fidelity is pleased to work with a variety of engineering legends and companies including Tim de Paravicini, Ed Meitner, Pass Labs, Theta Digital and Sony Electronics. Our joint efforts to seek out the ultimate audio experience, has resulted in significant advances for the technology of music reproduction. For over twenty years, Mobile Fidelity Sound Lab has continually searched for the ultimate audio experience. During this search MFSL engineers and associates created The GAIN™ System, a proprietary mastering technology which brought warmth and ambience to the compact disc format. A few years ago - with higher resolution formats on the horizon - the vision of GAIN 2™ began. As it stands today, GAIN 2™ is one of the greatest technical advancements in analogue and digital technology in the last ten years. It consists of a series of critical modifications and new components to Mobile Fidelity's proprietary mastering chain. We feel that GAIN 2™ has come extremely close to meeting this goal. The key accomplishments of GAIN 2™ System are 1) the ability to extract all the musical information as possible through the Ultra High bandwidth analogue tape playback system with proprietary custom tape playback heads, reproducer electronics and 2) transparently capturing and storing that information with the Direct Stream Digital recording system.